20 January 2016 Despite its continuing uncertain future, the Crystal Palace National Sports Centre recently hosted two open athletic meets in the 60m indoor track. As our latest press release reports more could be planned. 15 January 2016 In the January edition of Disability Motoring UK magazine, CPSP supporter Mark Davidson talks to Paralympian swimmer Susie Rogers about her training experiences at the Crystal Palace National Sports Centre, her local training venue. 7 October 2015 One year after the beginning of the public consultation by the GLA on the future of Crystal Palace National Sports Centre, and STILL its future is in limbo. Despite the findings of the consultation being published in May 2015, no announcement has yet been made following its recommendations. Out latest press release on this story can be found here. 29 August 2015 Crystal Palace National Sports Centre based athletes, Alex Yee and Matthew Threadgold, talk to the News Shopper about their optimism that as new President of the IAAF Lord Sebastian Coe could help secure a long term future of the athletics track, and centre as a whole. 26 August 2015 Following the election of Lord Sebastian Coe as President of the International Association of Athletics Federations, CPSP spoke to BBC London about the need to ensure Lord Coe fulfills his manifesto promise of ‘Growing athletics in a new age’ for domestic athletics at facilities such as Crystal Palace National Sports Centre, alongside his plan to reform global athletics. To watch the BBC report click on the graphic above or here. This is the associated press release. Crystal Palace Sports Partnership (CPSP) have been pushing hard to enhance the iconic Crystal Palace National Sports Centre (CPNSC) for almost a year now – and it seems we may have succeeded in at least earning a reprieve for the now rather dilapidated sixties-built centre. Following Sports Minister, Tracey Crouch’s recent rethink on a strategy for sport in the UK, due to dwindling participation figures reported by Sport England, the message on just how critical CPNSC is as a regional sports venue does seem to be getting through to those in a position to effect change. CPSP was formed after a shambolic top-down consultation process from CSM last year. It was found to have relied on flawed usage data, and engagement failed to include many key stakeholders and users in the key formative stages. Representing a cross-section of the local resident, business and sporting community, we are now established as a key player driving toward a positive but sustainable future for possibly the most accessible multi-sports venue in the UK. – A UK wide public consultation is currently taking place by the Department for Culture, Media and Sport. Entitled ‘A new strategy for Sport’ it runs until Friday 2 October. 4 August 2015 Following disappointing sport participation figures earlier this year from Sport England, Sports Minister Tracey Crouch declared she was going to ‘rip up’ the existing sports strategy and start again. 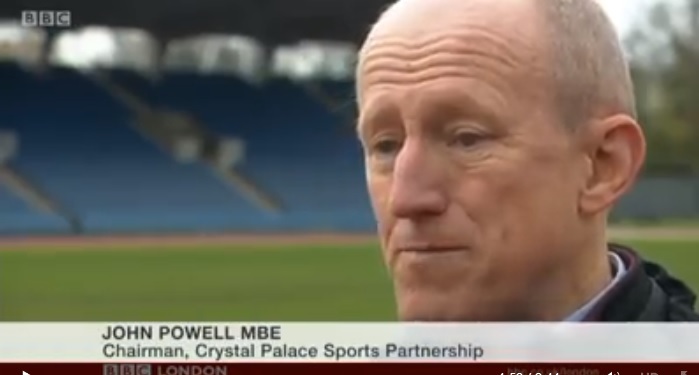 John Powell, Chair of CPSP, shared his thoughts on ITV about the lack of investment at the Crystal Palace National Sports Centre. In response for a fresh approach to UK Sport strategy Sports Minister Tracey Crouch launched a nine week public consultation, running until Friday 2 October. To have your say and participate follow this link. 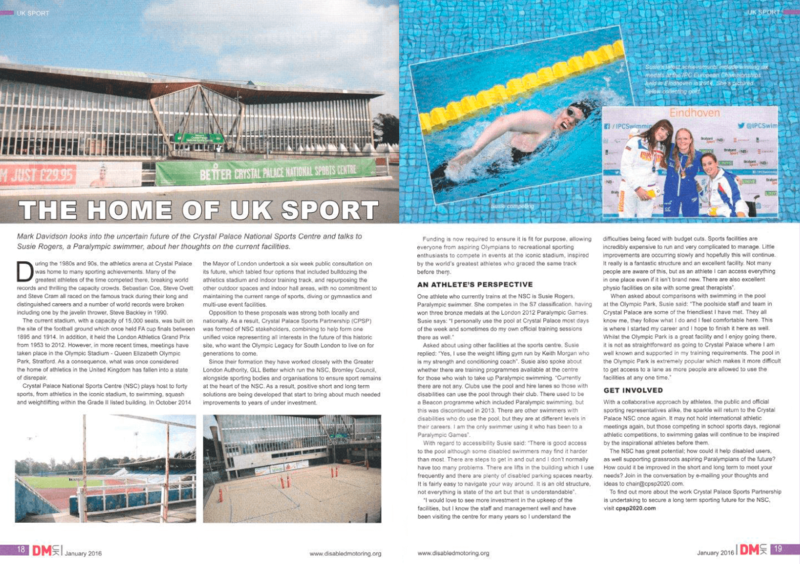 1 July 2015 In the July edition of the Swimming Times the threats to aquatics at the Crystal Palace National Sports Centre are raised, which critically includes demolishing the extremely well used 25m swimming pool, used daily for learn-to-swim lessons, school and club use. 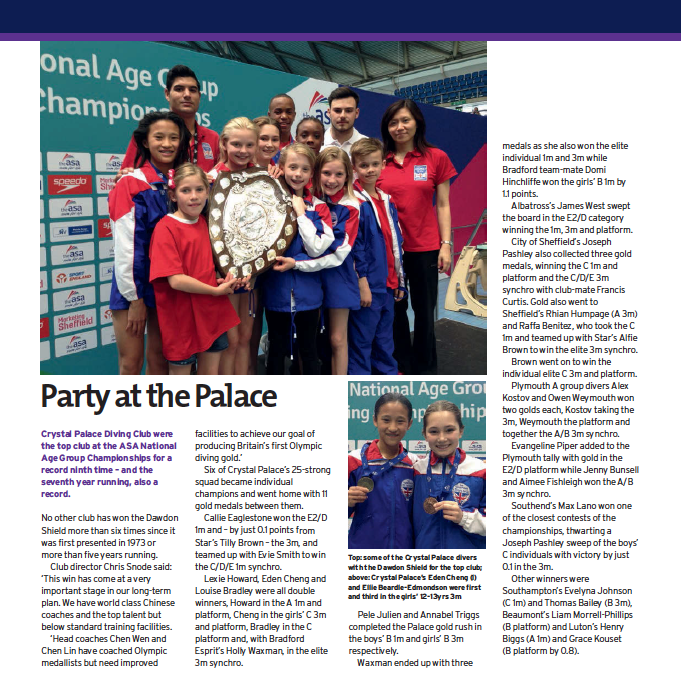 In an adjacent piece the record breaking achievements of the Crystal Palace Diving Club are celebrated, who for a record ninth time – seventh year in a row – were announced the top diving club at the recent ASA National Age Group Championships in Sheffield. 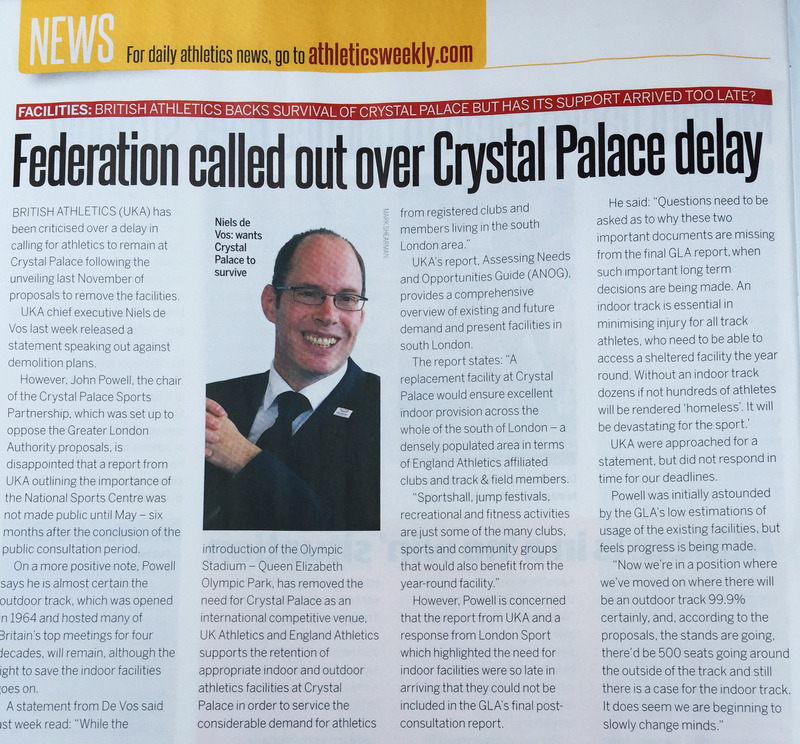 25 June 2015 Athletics Weekly questions why there was a delay by British Athletics in publicly declaring their support for athletics to be retained at Crystal Palace. Chair of CPSP, John Powell MBE, concludes the article stating that an outside track is a 99.9% certainty, and there is now a case for an indoor track, ‘It does seem we are beginning to slowly change minds’. 22 June 2015 Chair of CPSP, John Powell MBE, is interviewed on London Live to discuss the future of the Crystal Palace National Sports Centre, following the publication of documents by UK Athletics and London Sport which show they both support retaining athletics at Crystal Palace. 21 June 2015 As funding continues to be poured into the former Olympic Stadium in Stratford to convert it into a multi-sport venue, both to host football and athletics, BBC Sports Editor Dan Roan quotes CPSP Chair John Powell, on the consequences for athletics in South London, which could have been transformed had Tottenham Hotspur become the Olympic Stadium anchor tenant. 17 June 2015 Seven months after the GLA public consultation on the future of the Crystal Palace National Sports Centre, support from UK Athletics and London Sport has been made public. UK Athletics fully support continued athletics facilities, with both an indoor and outdoor athletics track, whilst any loss of existing facilities are of grave concern to London Sport. To find out more please read our press release. 28 May 2015 Much of Crystal Palace National Sports Centre (CPNSC) as we have always known it will be razed to the ground if the shortlisted options from the recently published GLA CPNSC Development Options Appraisal Final Report 2015 (redacted for publication) are executed. The report, published on 15 May 2015, is the results and findings from the CSM Strategic CPNSC Consultation that took place in October 2014. Our full press release in response to the findings can be read here. 12 May 2015 Crystal Palace Sports Partnership applaud the recent announcement of the creation of ‘London Sport’, which aims to make London the most physically active sporting city in the world by 2020, by encouraging one million more people to be more physically active within the capital. For the first time it brings together a partnership between The Mayor of London, Sport England, and all 32 London Councils. As a multi-sport community hub the NSC offers and facilitates 40 different sports. These include: athletics, swimming, diving, tennis, football, basketball, badminton, netball, martial arts, weightlifting, squash, hockey, cheerleading and roller derby. The site is unique in its range of sports in South London, and with a host of top clubs and coaches operating there, the opportunity exists for sportspeople to develop through from grassroots to elite. Yes, we agree! Making the most of the NSC is key to what we are about, and CPSP are campaigning to enhance what there is there already, as a long term sustainable multi-sport community hub indoors and out for generations to come. With a huge number of local clubs and sports specialists co-sharing the venue staying motivated and inspired make the venue unique in South London. The exceptional event nature of Centre attracts many local and regional school club access to discover value and benefits for sports from all levels grass roots and abilities. The centre is unique as it has multi-vendor supplier model. It hosts Crystal Palace’s largest employer, the Crystal Palace Physio Group, it has world class coaching clubs, international winning London Weightlifting Centre, and a host of other dedicated clubs and coaching staff operating regularly within the centre. The NSC has 50+ years of sporting heritage! Elite sport was the beating heart of the NSC, playing host to a ‘who’s who’ of UK and International sporting elites, who have inspired generations of grassroots athletes to achieve their Olympic aspirations. Since 1977 The London Youth Games have made the NSC its home. An event that attracts thousands of aspiring young Londoners to a host of different sports, continues to play a huge role in creating sustained grassroots sport accessible to school children from across London. It is at this event so many young people begin their journey to emulate LYG alumni such as Mo Farah and David Weir. 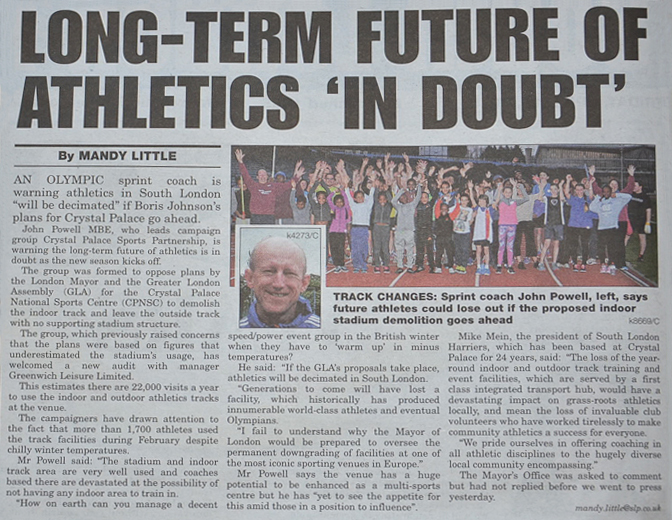 17 April 2015 The South London Press reports on the recent month long audit of the NSC indoor and outdoor athletic tracks, organised by CPSP in partnership with GLL. It clearly demonstrates the high track usage demand, which contradicts statistics reported in the CSM Interim Report. Our full press release in relation to the track audit can be read here. 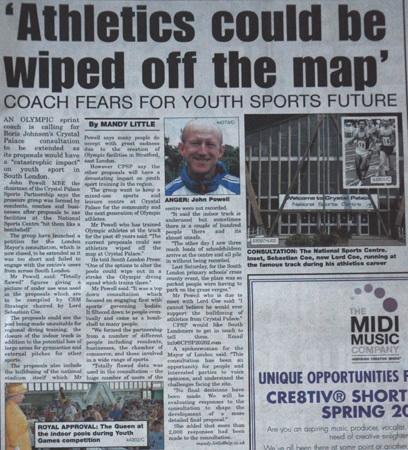 22 January 2015 CPSP latest coverage in Athletics Weekly featuring our Chair John Powell MBE. “Leader of Bromley Council has certainly come out very strongly in favour of a Sporting Academy in South London, a centre of excellence… that would be a flagship academy for London and the UK”. The full Glenn Lawrence Show can be listened to here. 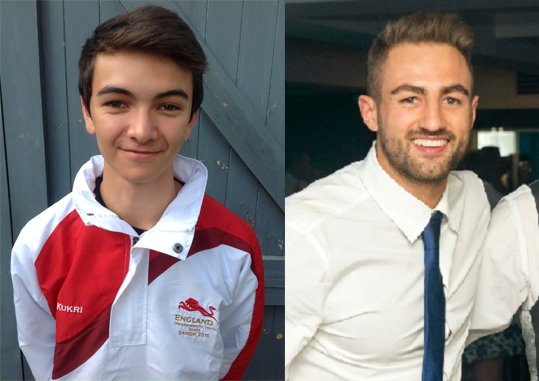 Crystal Palace Triathlete Alex Yee, 16, and Crystal Palace diver Annabel Triggs, 13 share their concerns about the future of Crystal Palace National Sports Centre in the Newsshopper. “I had a very positive and productive discussion with Lord Coe. Whilst the report on the community consultation is currently being finalised, he was sure that he wasn’t breaching any confidences in saying that there is strong support to retain the track, as per the options presented by CSM Strategic. Lord Coe also said that from what he is hearing, and he thought the team would reflect this in their report, there is also demand to revisit the need for continued indoor track provision. He believes the community consultation that was undertaken was the right process to go through and he was pleased that CSM was able to support this. He was also complimentary regarding local club and wider stakeholder engagement in the process. My own view, however, is that there will be acknowledgement at some stage that the data submitted through current operators GLL, was flawed and cannot be relied upon. 3 December 2014 BBC London News on Crystal Palace with Lord Coe and chair of CPSP, click here. Mr Powell said: “Totally flawed” figures giving a picture of under use was used in the proposals which are to be compiled by CSM Strategic chaired by Lord Sebastian Coe. The proposals could see the pool being made unsuitable for regional diving training, the closure of the indoor track in addition to the potential loss of large areas for gymnastics and external pitches for other sports. The proposals also include the bulldozing of the national stadium itself which Mr Powell says many people do accept with great sadness due to the creation of Olympic facilities in Stratford, east London. However CPSP say the other proposals will have a devastating impact on youth sport training in the region. 28 November 2014 GLA agree to CPSP information request, and provide CSM’s interim Development Options Appraisal report for Crystal Palace National Sports Centre of 29 July 2014 (regarding director decision DD1172, news item 4 April 2014). 21 November 2014 London Youth Games statement on Crystal Palace here. “London Youth Games Foundation supports any developments that improves London’s stock of facilities and gives young people greater access to take part or volunteer in sport. However, we are concerned the planning and consultation period for the redevelopment of the National Sports Centre, Crystal Palace is being rushed and not allowing for a wider assessment of London’s multi-sport facilities. The Foundation recognises the community sport opportunities that now exist at the Olympic Park. But we also urge that a legacy of the Olympic Games must be the enhancement of London’s limited facilities, not their replacement. Multi-sport facilities like Crystal Palace offer the unique benefits for new and elite participants to share expertise and facilities, for example weight training for weightlifters and athletes and tactical coaching for water polo and handball. We have hosted Europe’s largest annual youth sports event at Crystal Palace almost every year since 1977 featuring every London borough team. 17 November 2014 BBC1 London News broadcast a feature about the Crystal Palace NSC consultation, featuring CPSP chairman John Powell. This BBC news clip can be viewed on this youtube link. 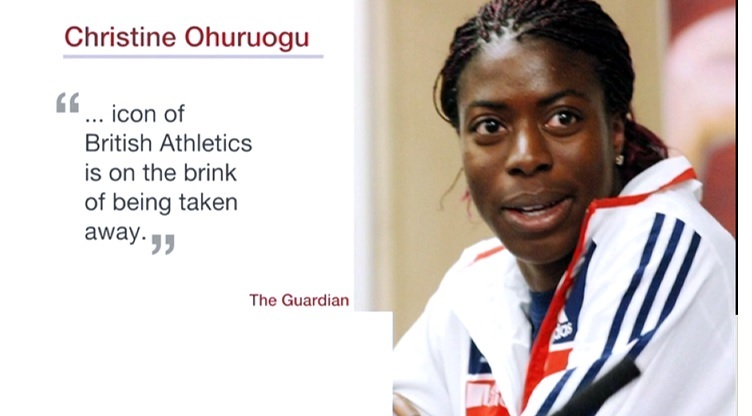 Christine Ohuruogu was quoted: “It’s a shame that a pivotal, memorable and hugely historical icon of British Athletics is on the brink of being taken away” (as reported in The Guardian). “I would like to convey a massive “thank you” to all those Facebook friends who have ‘liked’ our page, people who have signed our petition, in fact everyone who has contributed to the overwhelming support we have amassed in such a short time. Top athletes criticise plan to demolish Crystal Palace track in The Guardian here. “It’s a shame that a pivotal, memorable and hugely historical icon of British Athletics is on the brink of being taken away. It was not just a ‘track’ it was a place were athletes: local and international; elite and club; juniors, seniors, masters and everything else in between, competed, watched, cheered, supported…It is a track holding a myriad of memories for those fortunate enough to be at the National Sports centre. “I am absolutely appalled to hear the future plans of Crystal Palace NSC. This venue has been a key training and competition venue for many sports for many years; I not only have trained and competed at the venue, but seen individuals aspire and develop into champions, because of the history, accessibility and facilities of CP. Logic surely must prevail here…two years down the line since London 2012 and all we talk about is the legacy, yet taking away the only all sports venue in the South East is disgusting. Those who make such proposals have no idea of what damaging impact this could have for the community and future Olympians – they need to speak to the people in the know, i.e. coaches, athletes, parents to understand the need for CP and take their blinkers off”. 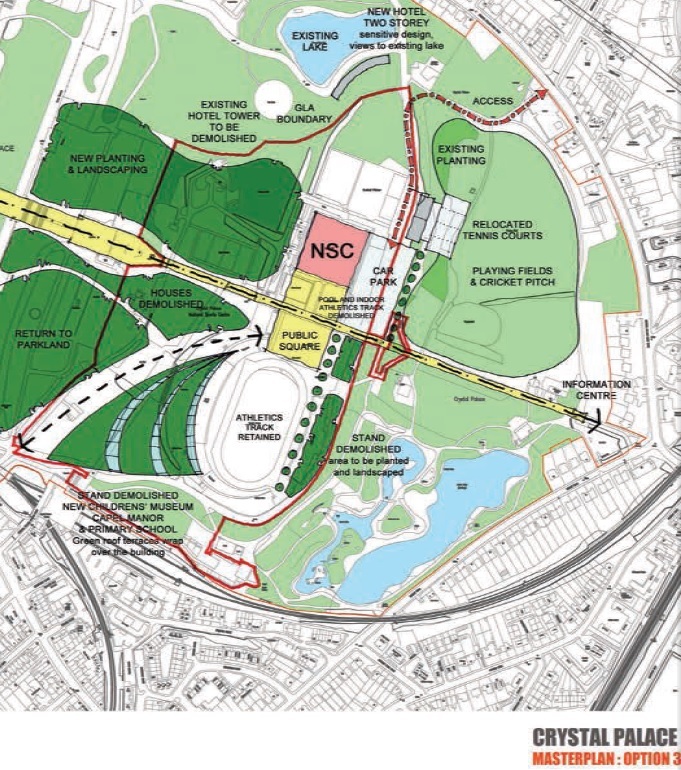 10 November 2014 Provisional briefing note from Crystal Palace Sports Partnership on the impact of the NSC consultation. 6 October 2014 GLA Online consultation on development options for National Sports Centre. June 2013 GLA publish The Fourth Annual Report of the London 2012 Equality and Diversity Forum report here in the series Working towards an inclusive Games. See page 44 for Iconic Facilities regionally-significant facilities catering for several sports. NSC not mentioned in the report. 5 April 2011 Mayor’s press release that Crystal Palace National Sports Centre undergone a major £17 million regeneration to bring it up to modern athletics standards, click here for details. South London to benefit from the legacy of London 2012 as the Mayor of London, Boris Johnson, confirmed that Team Brazil has chosen the Crystal Palace National Sports Centre as its training headquarters. 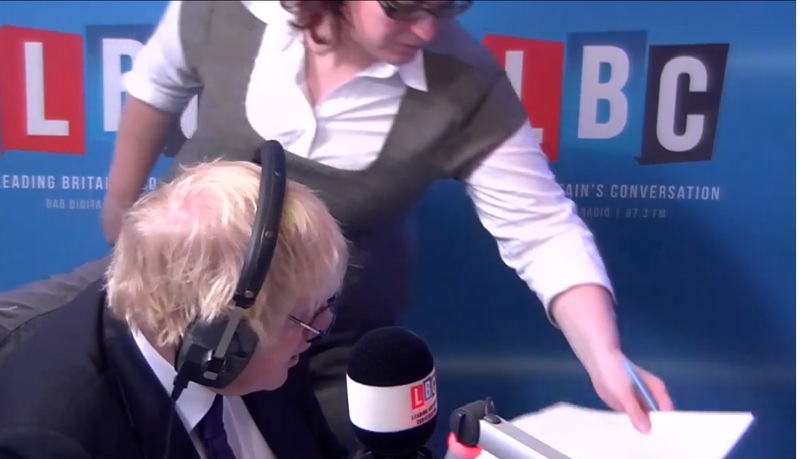 The Mayor of London Boris Johnson said: “Crystal Palace is a world renowned centre for sporting excellence…” here.